Blonde Problems: Making a Wish List, Checkin' it Twice! Christmas is around the corner, y'all! This week, instead of the usual #WantItWednesday post you know and love, we're sharing our Christmas wish lists. We've whittled our loves down to eight items each, but let's be real.... when it comes to shopping for ourselves, the limit does not exist. 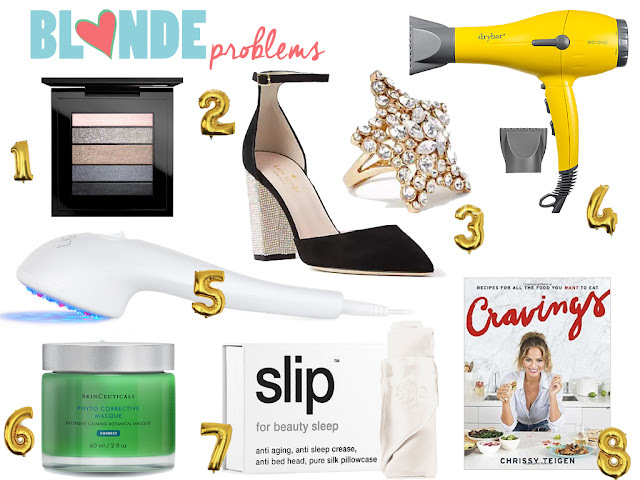 Check out what we're currently coveting and shop it for your fashion and beauty loving friends yourself. 'Tis the season! 1. MAC Cosmetics Veluxe Pearlfusion Shadow. When it comes to skincare and makeup, I pretty much stick to the same routine every day, but every now and then I need to change it up! I was instantly attracted to this palette, because I can find a use for every shade. I tend to prefer champagnes, blues or pinks when it comes to my eye shadow and I could use the black color as a sparkly addition to my eyeliner. One thing I love about this MAC palette is that they are powders that turn to a cream. I find that the powder/creams last longer and have a smoother application. 2. Kate Spade Pax Heels. A girl can never have too many shoes! These stone-encrusted heels would make the perfect addition to my New Year's Eve ensemble. They have cutest ankle strap, are suede (one of my favorite materials) and the heel size is just right! 3. Kate Spade Bright Star Ring. I have quite the ring collection already, but I think another addition is necessary with this sparkly show stopper. This accessory, made from 12-karat gold plated metal with glass stones, would brighten any ensemble! If you're feeling extra adventurous, Kate Spade also makes this piece into a statement earring and a stud earring. I've probably put this blow dryer on a regular WIW list before, because I've had my eye on it for some time. It's no secret that I'm a big fan of drybar, but I am in desperate need of a new blow dryer. The one I've been using doesn't have a nozzle and it's way too heavy. The Buttercup blow dryer comes with two different nozzles, has a 9-foot long cord (Which may come in handy on a Vegas trip) with a hang loop, and it only weighs 1 pound, 1 ounce. 5. LightStim LED for Acne. Every time I get a facial I opt for the 30-min LED light add-on, because it's amazing for your skin! I'm still in my 20s, so my main concern is keeping my skin clear. The blue LightStim helps calm and heal existing breakouts and lowers the bacteria count, minimizing future breakouts. For only $169 and free shipping, you can purchase your own personal LightStim handheld device. I work for a spa and LED light is a $40 add on, so this price is amazing! It's part of my job to be knowledgeable on all of the products we sell, and during a recent SkinCeuticals class, we learned about their new Phyto Corrective Masque. This mask is good for all skin types and it was created to help reduce redness and discomfort. You can use this post-travel, post-workout, and especially post-procedure. For someone like me, who regularly gets facial treatments, this masque is exactly what I need! This is another item I've been eyeing for quite a while. Sleeping on silk has so many benefits for your skin and hair, but these run at $79 a piece so I haven't been able to justify the purchase. 'Tis the season for two of these babies. According to the Sephora description, "When you sleep on silk, delicate facial skin is more hydrated in the morning and hair becomes healthier over time. Cotton pillowcases also cause sleep creases, which go away later that day but can cause fine lines and wrinkles over time." What's not to love about Chrissy Teigen?! I salivate daily over all of her and John's delicious concoctions on Snapchat, so it's time for me to take the plunge and buy her cookbook. One thing I love about Chrissy is that the recipes in her book are all items I would actually eat and there is plenty of variation. 1. Fileholder in Pistachio Blue. Last year, I gave a friend a really cool leather padfolio embossed with his initials and I've been dying to get one that suits me ever since. I tend to find it difficult to come across things that toe the line of professional and not so-masculine-I-want-to-gag and thought this gray-hued blue was a happy medium. The color is really charming without being too cutesy, no? 2. Eternally in Amber Icy Blue Scallop Wide Tooth Comb. This comb is giving me serious heart eyes. How lovely would this be sitting on my vanity? I wish I actually had a vanity...getting ready would be much simpler. I want everything from this sweet, little company, but a wide tooth comb is a fabulous start, since I struggle with tangles every now and then. 4. Flora Nikrooz Magnolia Robe. My current favorite robe is a gorgeous rose-colored cotton one in Marie Antoinette's favorite toile (My mom picked it up for me in Paris a few years back). I try not to wear it too frequently because I just love it sooooo much, so I've actually been on the hunt for another one for quite some time. 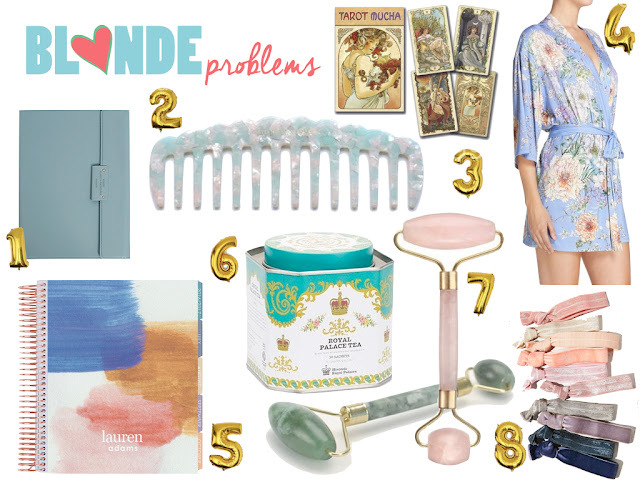 I'm enamored of this pale blue floral one and would be all too happy to lounge in it for an inappropriate amount of time each day instead of cleaning my apartment. 5. Erin Condren LifePlanner in Minimalist. Planning and list-making are two of my favorite activities. To have such a beautiful planner in which to do these things would be absolutely a dream come true. This one from Erin Condren is just on the verge of being so-pricey-it's-dumb, but I think having all my (insane) thoughts in one place would be well worth it. Looking forward to a more organized 2017! 6. Harney & Sons Royal Palace Tea. I'm mad for tea. I love trying new varieties and rely a lot on herbal teas to soothe various made-up illnesses and general malaise. I would much rather start my day with a nice cuppa than the swill that comes out of my Keurig, but rarely do I find a black tea that has enough kick and flavor to suit me. I know this brand to be great, and the packaging is too lovely to pass up! 7. Rose Quartz and Jade Facial Rollers. I've been ogling a rose quartz facial roller for more than a year now and I think it's finally time to make it happen. You hear me, friends and family? Put a biiiiiig star next to this one! You can buy a set of two, but I would like one of each -- a rose quartz roller and a jade roller -- as they have different benefits. Both activate the heart chakra, aid in lymphatic drainage, and stimulate blood flow. The perfect accompaniment to all those expensive serums and oils you've been hoarding! 8. Yoga Knot Ponytail Holder Set. I'm really weird about my hair ties. I loathe plain black and those wanna be "blonde" ones. For the past 5 years my go-to have been a really fun neon pack from the drugstore, but I think it's time to tone down my *look* a little bit, because the day-glo trend has long gone, and really, highlighter green and yellow don't match much, if anything, in my wardrobe.